In the mental health field and other helping fields, there is a painful awareness that life is full of suffering. I can say from my experience when working with so many people struggling, it is easy to become discouraged by it all. If you have battled with your own suffering or have witnessed suffering in another, you too may have experienced or continue to experience your own discouragement. Let's face it, life can be very cruel and difficult. So what can we do it about? How can we avoid discouragement and embrace the suffering within ourselves and the suffering in others? This is the opposite of compassion. Compassion in Latin means to "to suffer with." Suffering with, is all about accompaniment and shared vulnerability. And why? How does this help our own discouragement with so much pain in others or even in our own lives? Well the more we show compassion, the more our lives are transformed, along with those around around us. It in our compassion, we are reminded we belong to one another. It is in our compassion we are given eyes to see what has become unbalanced and broken. It is in our compassion, we are able to perceive what has been disrupted and needs repair. It is in our compassion, we are given the tools to offer healing and reconciliation. It is in our compassion we are united with others in a way that is very powerful and intimate. This only becomes tangible when we know and experience suffering. Therefore, as we embrace suffering and sometimes even wrestle with it, what once was unbearably painful begins to take new shape. What was once becomes transformed into new strength, new awareness, new wisdom, and deeper compassion. The moment we stop being compassionate and aim to rid suffering out of our lives completely is the moment we miss out from the good suffering can bring and the good work we can do in the lives of others. So when you're faced with yet another hurt in your own life or the lives of others, remember the gift suffering brings and the gift you can bring in response. We all know a "highly authentic person." These are the type of people who radiate REALNESS. They have the courage to share their voice. They walk with dignity. They use their talents and gifts with pride. They allow themselves to be- no matter how imperfect and ultimately they work hard towards having an integrated life. It may be hard to find sometimes, especially in a world that praises plastic, artificial and filtered BUT these people are out there and they live within us too. So how can we become like these people and live out our own "Highly Authentic Self?" Well much like anything, you have to develop a habit. You have to train your body and mind to authentically live. Habits are only created through persistence and conviction. You have to be dedicated to making authentic decisions and you have to strive for a more authentic self, everyday in a way that makes sense to you! Remember, if it doesn't matter to you, it won't change you. The hope is that as you practice living authentic, the habits you form become involuntarily. It just becomes a natural part of your daily experience. So if you're like me and want to live a highly authentic life, here's some habits I learned from the highly authentic people in my own life. I hope these 7 habits will be useful for your own journey! Highly authentic people (HAP) listen well. They listen well to others AND they listen to what their mind, heart, body, and soul is communicating. HAP's know that all that makes us who we are (our mind, heart, body, and soul) is constantly communicating messages to us that need to be heard. HAP's understand that when we fail to listen, we ignore important aspects that will lead us to a more authentic version of ourselves. HAP's know when we listen to our heart, mind, body, and soul it's important to respond to the messages. For instance, when a HAP is feeling anxious, they will slow down and uncover why they are feeling anxious and what the feeling may be communicating to them. HAP's understand when we fail to respond to the messages, it makes us less aware of ourselves and further away from our authentic self. HAP's also know when we're listening and responding to ourselves, we begin to know ourselves very well! However, HAP's are aware that even when they think they know themselves well, there's still work to be done. HAP's make sure to continuously make an effort to soul search. They search for what they are most passionate about, what their hearts are yearning for, what they still need to improve on, what's still holding them back etc. In other words they ask the BIG questions and they don't stop asking them. HAP's understand the reality is that we're all going to mess up constantly AND they're okay with that. HAP's see imperfections as something good. They see it as something that remind us we're alive and keeps us engaged in deepening our self-knowledge. HAP's embrace imperfection, rather than shaming it, deflecting it, hiding it, or denying it. They keep themselves rooted in compassion, grace, patience, peace, which are all of the fruits of an authentic life. The HAP isn't authentic because their lives are perfectly held together but because they are capable of holding their self together, in light of their imperfections. In other words, HAP's see their imperfects as important aspects of the self that serve to keep us whole and connected to who we really are! HAP's believe that practicing self-compassion and creating time to care for your needs are important ways to love yourself. Too many of us fail to love ourselves which robs us from authentic living. HAP's avoid this trap and are not cruel to themselves. They do not harbor angry feelings towards themselves or harshly criticize themselves. They allow room for error and celebrate their achievements, gifts, and talents. They take time to know their worth and their unique intricacies. They also take time to nurture themselves, giving their body, mind and soul opportunities to replenish and enliven! HAP's understand that each person has beliefs they identify with and values that are important to them. They believe when you're unaware of these beliefs and values, or you do not allow yourself to be grounded in them, you can easily fall into an inauthentic trap. Therefore, HAP's courageously practices their beliefs and values so that it shines from within. They do not hide it or allow themselves to be easily swayed by another person's beliefs or values. They stand firm in what they find valuable and important. HAP's make sure to spend time with people who they can give and receive love from. They also create boundaries when they are not receiving love. Highly authentic people also have a clear understanding of what sets their soul on fire and they make time to pursue whatever that is; whether it's spending time in nature, painting, listening to music, meditating, praying, gardening, they allow themselves to be immersed in love! HAP's speak the truth. They are not afraid to say "I am not doing okay." They are not ashamed to admit their faults. They do not hide behind a facade of false beliefs, disingenuous relationships nor fictitious identities. They know who they really are and are not afraid to reflect their true selves in their behavior. Highly authentic people are also able to effectively communicate their feelings and express their opinions and ideas, even if that means offending or hurting someone else. They understand that living a lie often results in causing more hurt, therefore they are committed to living truthfully out of respect for themselves and others. I hope these 7 habits helped inspire you! If you noticed the abbreviation HAP is just two letters away from spelling HAPPY. Remember the point of being a highly authentic person is to live happy. As you pursue an authentic life you may discover different habits or add to this list, but whatever you dedicate yourself to and repeatedly practice, I hope it leaves you feeling fuller and happier. Leave a comment with the habit you're going to try practicing in your daily life! But rather more questions, and uncertainties? Can you stand firm on solid ground, on rocky ground, on soiled ground, and become unearthed by your own foundation? Will you be able to laugh and to cry, and yet not choose one over the other? Can you stay still in the raw, authentic, imperfect you without needing a quick fix? To listen to the voices, quiet, and loud, near and far, and find the truth? And not be frightened by the chaos? To look in the mirror, and not turn away? Can you acknowledge your shame and somehow find your beauty? Will you walk in your loneliness and discover true companionship? Can you question your beliefs and become more faithful? and rest in an unshakeable peace? Mental illness can be very isolating and it's easy to withdraw from others. However if we want to overcome the symptoms that come with it, we'll need a strong support network. So when we're feeling like staying in a dark room for several hours each day, we need to call a friend, or spend time with someone who brings out the best in us. Comparison is really easy to do, especially when we're not feeling good about ourselves. It's easy to imagine what we would like with a better, wealthier, nicer, prettier______ (fill in the blank). However the more we compare, the more we lose sight on all the good that is already within us and around us. Social Media can also be a platform for comparison frenzy. If we find ourselves comparing ourselves to every picture we see, than we may need to put the electronic device down- our precious self-esteem will thank us later. It's easy to get into the rabbit hole trap of negativity. Negative thoughts run rampant in the mind of those with poor mental health but the only way to think more positive is to surround ourselves with more positive. Which means what we watch, listen to and whom we gather with matters and influences us more than we can imagine- so watch, listen, socialize, positively. Depression makes it extremely challenging to give your body the right nutrients. Depression can make people eat too much or not eat anything at all. It's important to nourish your body and fuel it with the vitamins (like Vitamin C + D), a lot of water (stay hydrated and avoid sugary drinks), and balanced meals (if it comes from the Earth, eat it). Also keep it movin'. Your body wants to be active. In fact, some studies suggest that working out enhances people's mental health more than psychotropic drugs and therapy combined. Something that gets in the way of mental health is having poor boundaries. This often looks like helping everyone, over-working, over-productivity, saying "yes" when you really want to say "no," and allowing others to take advantage. It is a difficult task if we had poor boundaries for quite some time but the more we create the boundary, the more space we have to nurture yourself. When we're feeling depressed it's hard to think positively about ourselves and when it's hard to think positively, truth often times goes missing. Negative thoughts repeat creating mantras of "not good enough" and the wonderful things that make us, special become something terrible, disgusting or shameful. So when positivity seems out of reach and our mind fills with untruths we must bring back logic and remind ourselves what's good about us. We may have to do some deep soul searching or reach out to someone who loves us to remind us...again...again...and again how great we really are. In other words, it's important to do whatever it takes to stay grounded in who we really are. Nature is one of our greatest gifts and the best part about it is it's free! Being out in the sun, feeling cool breeze, sitting on a luscious bed of grass, gazing at the stars, letting drops of rain fall down your face, or allowing an awesome sunrise or the grandeur of a mountain take your breath away helps you to get outside of the chaos within to the natural beauty all around you. Also, studies show that the more time people spend in nature, the happier they are. Studies show that living a more gratitude-filled life increases happiness. It may be helpful to start a gratitude journal or to begin and end the day in thanksgiving. Creating space to recount what we are most grateful for, no matter how big or small, can lead us to more appreciation for what we have instead of what we lack. It also shapes our perspective in other aspects of our lives so that we can experience all the good that is happening within and around us. Often times when we're feeling depressed, anxious, angry etc. we're not taking the time to explore the 'why.' When we're feeling intensely we're just stuck in the feeling. This most likely is due to the fact that it's hard to unearth the why. It's usually buried in uncharted territories in our heart. In order to discover the why it would take having to really see what went wrong and who has impacted us, which can be very painful. However, when you know the 'why' you can discover better solutions and your specific pathway towards healing. We really can't heal from a wound we don't know about. This is where therapy comes in. Therapy helps you discover the root cause and with more awareness, you can find ways to live a mentally healthy life. Whether it's asking for help from your therapist, parent, friend, pastor, neighbor, or God, asking for help from someone you trust can offer you a release from the heaviness of your burdens. Asking for help, also acknowledges that you can't do it alone and why should you? The weight of heavy emotions is not easy to live with and the more support you receive, the more empowered you feel to take on the challenges and overcome the struggle. I hope these 10 commandments are helpful to you! Please note that these 10 mental health commandments are not written to replace the real "10 Commandments" or to diminish the value of God's holy law. 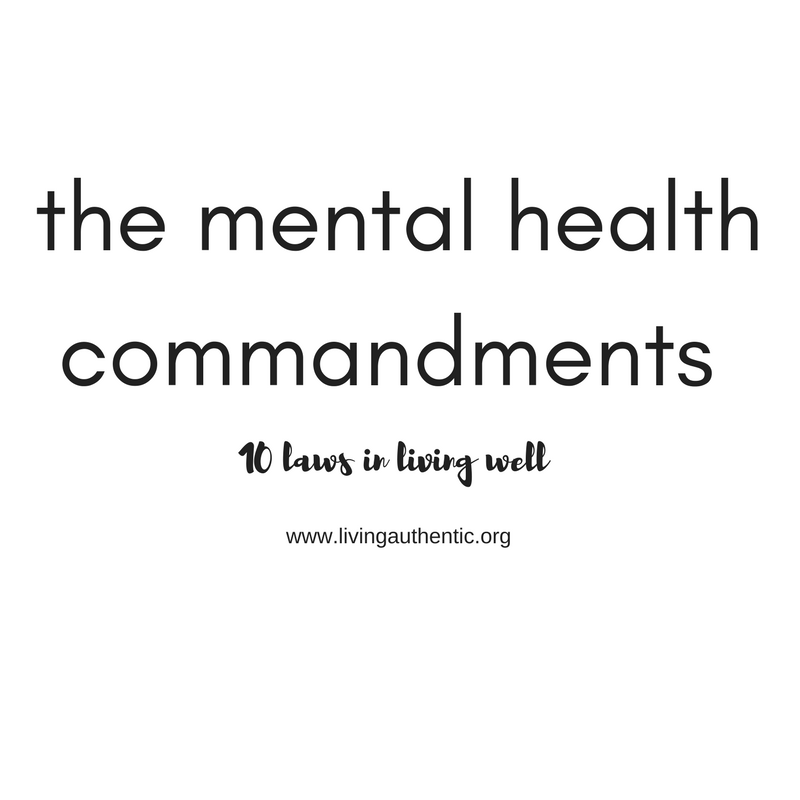 Use these 10 "commandments" as a resource and know they're named "Mental Health 10 Commandments" simply because it's a catchy title AND they really are vital to holistic mental health. With this being said, share your favorite commandment on the comments below or which commandment you can begin practicing more! I am a planner. I like to make things happen when, where, and how I want them to happen. The reason is simple: there's comfort in control. The thought of not being in control scares me. I am ALSO the queen of what-ifs: If I am not planning and in control, what-ifs run rampant: "What if I'll never get married?" "What if I'll never graduate?" "What if I'll never be able to afford a place to live?" (Real life questions I've often wondered. I don't make this stuff up). The truth is I do not want to be disappointed by the unknown. However, the irony is that in my efforts to control the unknown nothing ever went as planned and I was left disappointed. This is because life is unpredictable. This doesn't make life bad, uncharmed or fearful but simply life. As obvious it is to most of us, it's really not that obvious in the moment. At least it's not for me. In the moment I am too anxiously preoccupied with what could go wrong and what I hope will be better. My reaction is quick: I need to do something about it. I need to plan and then act. I like to think that many of us want to be in complete control of our lives and no matter how many times we've been disappointed before by the reality that we are not in control, we often set ourselves up for the same painful outcome. Instead of riding the waves of unpredictable adventure, we'd rather ride the tides of false control. So as I would plan, plan, plan, thinking I was in control, life would catch me by surprise. The waves would come crashing down and my precious plans would come down with it, then human reactions would follow: Get angry. Blame others. Try to plan a different plan to get yourself back on the "right" plan. Lament over the melodrama that life is terribly cruel and unfair. This would happen again and again, and again making me feel even more fearful, uncertain and more desperate for control. This was and continues to be no way to live for me and my hope is it's no way to live for you. When we live like this we rob ourselves from the present moment. We fail to live with wonder with life's unplanned gifts. We take away any potentiality for greater wisdom to enter our minds and peace to enter our hearts. Therefore in order to live this wild adventure with peace, we must surrender our false sense of control. It may sound counterintuitive but it's our false sense of control that makes us more afraid. We become fearless when we let go. It definitely sounds easier said than done but practicing surrender in our daily lives builds our resiliency and capacity to handle life's many stressors. You may be thinking, what does this exactly look like? Well for me, it's about practicing three major exercises of surrender everyday. Praying or Meditating- Focusing on the present moment (not the past or the future where control is definitely out of reach) but silencing the noise around you so that you can be still to what is within you and for those who believe in an almighty God, what is above you. These acts are also about acknowledging your limitations with compassion. So whether it's saying "God, I trust in you, let your will be done" or "I don't know what the future holds but I will be okay" you're able to let go of false security and experience peace. Forgiving- Sometimes our need to control is all about avoiding hurt and pain, especially for those who know hurt and pain well. However, a daily practice of understanding the imperfections in others and our own imperfections, helps us to let go so that we're not overpowered by resentment or fear. Deep Breathing- Something that we can control in our finite world is our breath. Practicing deep breathing can help us gain a sense of power over our lives, regulate our heart rate, lower stress, and can ground us in a reality where we can grasp self-mastery and feel calm in the midst of uncertainty and helplessness. I leave you with the serenity prayer that I believe encapsulates this all -Accept the things you cannot change, courageously change the things you do have control over, live one day at a time, enjoy the present moment, and allow everything we experience, even the difficult experiences, to teach us and offer us peace. 1. What do you need to surrender that's not giving your life more happiness and peace? 2. What might be standing in the way of surrender? What might you be holding unto with clenched fists? 3. What would a life of letting go look like for you? How could letting go daily positively impact your life? Having problems isn't the problem. It's our inability to sit with the problem and allow the problem to guide us to deeper reflection and understanding. That's what causes the pain. That's what creates the confusion. That's what prevents patience in our healing journey. What might your wounds be trying to teach you? Sometimes it a lot more easier to forgive others than forgive ourselves, but in order to experience true peace, we MUST learn how to compassionately accept ourselves and allow grace to touch our own hearts- no matter how broken, flawed, or unworthy you may feel. What might you need to forgive yourself today? We can't really change ourselves without first examining our thoughts. What is your personal schema? How do you view yourself? How do you view others? What automatic thoughts circulate for you? How do these thoughts get reinforced? Once we figure out what are thoughts are and how they shape us, we can then discover how to change them. The old saying stands true, "Change your thoughts, change your life." So Sigmund Freud may get a bad rep from the general public and even within the psychology field, but he had some genius ideas and amazing ways to conceptualize human experience. Here's one of his revolutionary ideas that challenged the status quo: Our vulnerabilities are not weaknesses. When we are able to see the truth embedded within this belief, without shame, we can courageously embrace our vulnerabilities and use them as the source of our strength. What are your vulnerabilities? How can they be used as strengths? Believe it or not, you're entire past doesn't have to define you. Although it shapes your current perceptions and experiences, it doesn't have to make you who you are. We can learn from our past and make a decision to take what we want from it to shape and mold our present and our future. What do you want to choose to become? What parts of your past do you need to let go so you can become who you want to be? It is always extremely frustrating and debilitating when we feel like we can't change our circumstances. Nothing feels worse than feeling stuck. However, Victor Frankl, a man who survived the concentration camps and knew suffering well, understood that we have more power than our situations may make us believe. The truth is, power is given to us from within and we can use that power to change the way we perceive our lives. We can create profound meaning even in the most terrible circumstances. How can you change yourself so that you can feel liberated in whatever difficult situation you find yourself in? Often times the chaos we feel within are not matters of trying to please ourselves but trying to please others. We are relational beings. We seek to be accepted. We seek to be cared for. We seek to be known, to be seen, to be valued. Much of our hearts yearnings come from what we seek in other people. However, it is a dangerous trap to live to please others simply because people will disappoint, will fail to reciporcrate or always want more. Therefore, we must live to please what is true, good and beautiful about ourselves and higher than ourselves, to be in full communion with what is most authentic and fulfilling. Who might you be trying to please? In what ways has it created strife in your life? How can you practice pleasing yourself and what's greater than yourself? You've heard it many times. Struggle and defeat make you stronger and wiser. But we must let this truth really sink in. Our ability to encounter our defeats, our brokenness, our shame, our struggle, helps us to learn a lot about who we are, where we've come from, what breaks us, and how we can use all of it to make us the people we desire to become. What are the defeats in your life that you need to encounter? What can you rise from? How can you still come out it? What hurts you, what moves you with tears and fills your heart with sorrow, matters. Without knowledge of this, you'll never really know what you live for and what you can do to make an impact on your own life and the lives of others. These sorrowful disruptions in our lives, although painful, are very necessary. Each time it happens, we are invited to make something beautiful out of the pain- whether it be art, new awareness or consciousness, service to others, new music, new friendship, etc, we can be stirred in a powerful way to make something positive with our unique strengths and individuality. In what ways is your brokenness revealing something about who you are? How is your suffering touching your own uniqueness and most intimate individuality? What can you do to make something beautiful with your suffering and pain? Nothing hurts more when you're struggling than being shamed for struggling. "Why are you being so weak?" "Can you stop being a baby?" "Just pick yourself up and keep going, what's wrong with you?" Sometimes, it's not even other people who do the shaming, sometimes it's our very selves. How terrible this is! When there's no room for compassion, there's no room for growth and healing. When it comes to strong mental health having compassion for others and self-compassion for ourselves is paramount. Shame disrupts all of this. Although shame is a common response due to a variety of different reasons, it has no room in the mental health journey. The truth is you're going to struggle, you're going to mess up, you're going to take two steps forward and three steps back, and that's okay. It's a part of the process and it's a process to be accepted and validated, rather than shamed. So how you might be plagued by shame? What does shame tell you? How can you let go of shame and allow yourself to be imperfectly human? Have you ever met a really joyful person? They're the kind of person we have learned to despise. You know the kind of person who always seem to be at peace. The kind of person who always has something positive to say even in the most terrible circumstances. The kind of person who radiates compassion and love, and who knows how to laugh well in the face of uncertainty and chaos. Well as much as it pains me to admit it, I am naturally not this kind of person. Being joyful is incredibly difficult for me. There's so much to complain about it, feel unhappy with and intensely criticize. However, if I am continuing to be honest not being a joyful person has rendered a lot of pain. So after many years of asking the critical, self-defeating question, "What's wrong with me?" and "Why can't I be more like _____" I began delving deeper into my past through my own personal therapy. In therapy I discovered that I wasn't too broken or too wounded to be joyful but I simply was living inauthentically. You see, you can be a joyful person and an imperfect, wounded person but the problem is that most of us do not know how to be an authentic person, which is where our true joy lies. That's the ONLY difference between the joyful people we envy and our very selves. Joyful people know how to live authentically. HOWEVER, I HAVE A DISCLAIMER, just because you live with joy does not mean you live without pain. Authentic living is joyful living, and it's also painful living. It's incredibly hard to look at your pain and wounds and have the courage to heal. It also takes a lot of strength to be able to accept your limitations and imperfections and have the bravery to keep going. But when you're able to accept the pain and use the pain for a greater purpose, it becomes the only pathway for true joy. Therefore, we have to choose joy and keep choosing it, even when it's hard. The moment we stop this difficult work is the moment joy becomes something much more fleeting, meaningless and inauthentic, and a result, so does our very lives. So embrace yourself entirely along with all of life's messiness and complications. Never trade your life for another. This is your unique journey and it's a journey when lived authentically, can be experienced joyfully. 1. What parts of you need to be integrated so you can live more whole? 2. What do you need to let go of so you can be more of who you really are? 3. How do you know when you're living your most authentic self? Does it connect you to living a joyful life? but what if you dared to show how you really felt? so that you can courageously be who you really are? would your heart break free? would the permission to feel grant you freedom to express? would the mask come off so you can breathe? I'll never forget a conversation I had with a gorgeous fourteen year old with big brown eyes, perfectly full lips and flawless olive skin. She was stunning on the outside but on the inside she did not think she was good enough. Our conversation began when she asked me if she should get green colored contacts. I remember feeling saddened by her question and puzzled why she did not feel content with her own beauty. Admittedly my response to her was rather strong. Embarrassed by my strong reaction I remember trying a more gentle approach. I asked her with a calm, therapeutic tone, what made her want to get green colored contacts. Her response showed that she had thought about getting green colored contacts for quite some time and was already sold on the idea that it would make her prettier. She even went on to demonstrate her desire by showing me a picture of a light-skinned girl with green colored contacts. In that moment we were both having our own parallel processing. I did not believe what had just come out of my mouth because for most of my life I had never really believed those words. For her, she was able to come to grips with the real reason why she wanted contacts and as a result face the pain of feeling "not enough." Several months had passed and she ended up getting the green colored contacts and although it hurt me to see her beauty brown eyes had been covered, I empathized with her. The truth is when I was seventeen years old I had bought my first and only pair of green colored contacts (the parallel processing went real deep). I remember struggling to put them on and poking my eyes several times, desperate for the contacts to settle over my dark-brown eyes. After much probing, poking and placing I was relieved when they finally covered what I thought was not beautiful enough. I felt so gorgeous and I flaunted them around with pride. Looking beautiful only lasted a day because my rough hands quickly damaged my green colored contacts when I tried to take them off. However, metaphorically, I'm not sure if they ever were completely removed. I've clung on to "green colored contacts" all my life hoping that it would change what I saw in the mirror. It never it did. When my expectations met reality I still did not feel beautiful enough. It was never enough. There was already more I could change. I think many of us feel this way and clinging on to our own "green colored contacts," especially as women. However if we live our lives this way our "contacts" will not help us see clearly but they will make us blind. The reality is beauty is never about searching for what we do not have and attaining what we don't own, but it's about radiating what we already possess. When we are able to own this truth and boldly proclaim it by the way we live our lives, our blurred sight can be strengthened into clearer vision, which is something a lot more true and authentic. So what green colored contacts are you trying to buy? Because if it's not artificial green lenses to change the color of your eyes, I'm sure it's something else and that something else could never make you more beautiful than you already are. 1. What makes you beautiful? What's something about you that you can learn to appreciate and radiate to others? How can owning what you already possess make you more beautiful? 2. What makes you feel not beautiful? What "green colored contacts" have you tried to buy to make you appear more beautiful? Did it satisfy you or did you end up searching for more? 3. Think about someone in your life who is truly beautiful? What makes them so beautiful? Do they seek to change themselves or do they accept who they are? Reflect on what your definition of true beauty is and how you plan to live that definition out. Throughout my life I have always been a sensitive person. I care a lot, I feel intensely and more often times than not, I am on the verge of tears. In fact, I am so sensitive that even my skin is considered "sensitive." I wear sensitive-skin makeup, use sensitive laundry soap, lather myself with sensitive-skin lotions... the list goes on. And as much as I know that my sensitive response to life and my skin is probably mere coincidence, the reality is that the label of being "sensitive" has stuck with me like hot glue and has been a heavy burden. Let's be real, "being sensitive" comes with a lot of scrutiny and can be shameful. We often hear, "You're too in your feelings," "Quit being a cry baby," or "Stop being emotional." And why? Well society believes you you need to always be "put together." You can't be "weak." Vulnerability and/or "weakness" makes people feel uncomfortable. Which creates a lot of people pretending, hiding, numbing, and isolating their feelings, including myself sometimes. However I learned that when we embrace our sensitive soul being "weak" becomes a great source of strength. So how do we embrace our sensitive souls and allow it to be a source of strength? First, we need to courageously allow whatever emotion to come and examine the meaning. Our emotions are our friends. They communicate important messages to us. So if you're like me and crying all the time, what does the emotion stem from? What may your tears be communicating? When we allow our emotions to come and understand the meaning, our emotions gift us with deeper insight and self-knowledge. It's denying our emotions and pushing them away that's cowardly. Second, we need to stay close to others and communicate often. It's so important to rely on the people in our lives and share our feelings. When you're a sensitive person it's easy to bury all our feelings inside out of fear that people won't understand but the truth is, sharing our feelings with others actually helps us grow, develop new insights and it strengthens our relationships with others (the more vulnerability, the more authentic our relationships will be). Lastly, we need to acknowledge that feelings remind us we are alive even the most painful feelings. It is a gift that we are not numb, unable to experience the variety of emotions. It is a gift we are not zombies, just going through life as if we are already dead. It is a gift we are not living like warriors, always on guard and always ready to fight off emotion. In other words, we may feel intensely but the feelings make us in touch with our authentic humanity. Therefore, having a sensitive soul doesn't have to be a heavy burden. Once you see it as a gift, it can help you become an even wiser, more connected and stronger person. So cry. Get upset. Feel sad. Listen to a heartfelt song. Tell someone you're not okay and remember you are alive! 1. Do you consider yourself a sensitive person? A stubborn person? A strong person? A weak person? Whatever you identify with, how does it affect the way you live your life and see yourself? 2. How can you allow yourself to feel more? What holds you back from fully expressing yourself? How can feeling more, help you live a more authentic life? 3. What are some things you can do to be more in touch with your own experience? The most natural and common thing to do when you're feeling depressed is to go deeper within yourself. You can't help it. You feel like you're losing yourself. You just want to sleep. You can't sleep. You're eating all the time. You're not eating at all. Your thoughts are negative. Your hope is fleeting. You're aching from your own feelings or lack thereof. I get it. However, if you want to overcome depression, you have to do activities that get you outside of all that's going on within you. For example, try writing a nice message to a friend, calling someone you care about and asking them how they're doing, volunteering at a local non-profit, or doing a generous deed for a random stranger. The more times you go outside of yourself, the more depression struggles to make its home within yourself. Putting words to your feelings with pen and paper is powerful. So often the outcome of depressive feelings are avoidance and confusion. Avoidance of the painful feelings and confusion over why you're feeling the feelings in the first place. When we're able to journal honestly about our feelings, we gain a better understanding and clarity of why we might be feeling the emotions. We also learn more about ourselves through the process. It's amazing what you're able to record with pen and paper when you give yourself permission to just think, feel and express. Eventually what you record offers you the awareness and solutions you need to overcome the symptoms of depression. For those of you who HATE writing, you can still enjoy the fruits of journaling by simply jotting down key words or phrases or drawing pictures that represent your thoughts and feelings. Try it out. Amaze yourself with your own ability to face whatever pains you and find viable solutions. Talking with someone you trust is much like journaling because you're able to fully express yourself, face whatever pains you (without avoiding) and discover new ways to understand yourself and cope. Anytime we express ourselves authentically we shed light on what's hidden in the dark. Talking to someone you trust offers you extra light because this person can help you to see your blind spots, make connections and encourage you to see the little glimmer of hope that's always somewhere on the horizon. Also, let's face it, sometimes we just need a good laugh and positivity. You can leave it to those whom you have positive relationships with to provide just that. Whoever you talk to, whether it's your therapist, friend, grandma, or parents make sure you feel comfortable and free to express yourself (if not, don't bother. It can cause more harm than good). Also, remember that not everyone understands depression, in fact, very little people do unless they've experienced it. So it would be wise to not aim for complete understanding but for someone to hear you out without judgment. Get active. Go on a walk. Run. Swim. Jump. Dance. Climb. Whatever it is, make sure you're increasing your heart rate and getting your body moving. Why? Because movement is good for the soul. It's proven that movement is able to decrease depressive symptoms. In addition, it keeps your mind more focused on the present moment which helps you better connect back to your body and your environment. It may be difficult to feel motivated to do anything, let alone move from the bedroom to the kitchen but this is a step where you REALLY have to push yourself. Your body, soul, mind, and heart will thank you later, I promise. There's nothing like a great song that can get you feeling a little bit more hopeful, happy and free. Music can help lift your spirit and increase your ability to think more positive thoughts. When you're feeling depressed, it's so hard to think positively. You're basically listening to the Blues on repeat or the saddest Country Western song you can think of. Not helpful nor positive. Avoid these sad songs at all cost. If you need some suggestions check out my Spotify playlist "Stay Positive" linked at the top of my blog. It's guaranteed, at the very least, to cause wonder of the possibility of a life filled with joy and hope. Whether it's books, poems or quotes sometimes you just need to connect with words that are more inspirational than "Life would be better off without me" or the long list of "I'll never be ___enough" (I'll let you fill in the blank). You need to be empowered. You need to be strengthened. You need those words that make you stop where you're at and re-think. Soul-clenching words that remind you why you're alive. They're out there. Find them and read them. Check-out the "resources" tab on my blog for inspiring poems and books. Remember that thing inside of you that has the power to invigorate you? That thing that awakens your passions and fuels you with purpose? Maybe you forgot about it or haven't seen it in awhile but it's still there. You have a spirit. A spirit that moves you with joy and gratitude, peace and passion. The best way to connect with your spirit is by doing things that stir your spirit such as painting, drawing, being in nature (marveling at life's beauties), meditating, prayer, and spending time with those who bring out the absolute best in you. Whatever you choose to do, remind yourself that this spirit is inside of you and revive it. No matter how empty it feels inside, remember this spirit never leaves- it's what keeps you hoping, believing, climbing, and moving forward to better days. I hope these 7 things to do were helpful to you and if not, know that's okay. What's helpful for some will not be helpful to others. Managing depressive symptoms is all about trying and striving; Trying new things to help alleviate some of the distress and striving for whatever will get you out of the loss of self-hopeless-tired-influx of sadness rut. When you do find something that works, STICK WITH IT. Consistency is key. Depression always seems to find it's way back but consistency keeps it from stealing your joy, your identity, your energy, and your hope! 1. Out of the 7 things listed on this blog post, what one resonates with you the most? Why do you think it has worked or has to potential to work with you? 2. What are some other things you can do when you're feeling depressed? 3. Write about your depression battle-plan because let's be real here, depression IS the enemy when it's stealing your joy, identity, energy, and hope. Your depression battle plan is everything you can do to defeat the debilitating symptoms of depression. What will you consistently do to live your life victorious? Several months ago before graduating with my Master's in Counseling Psychology a huge surge of doubt filled my mind. I thought I couldn't do it. I couldn't be a therapist. There was no way that I could help others when I couldn't even help myself. Let's face it, I am still not over my own wounds. I struggle with depression. I am highly sensitive. I'm painfully critical of myself. I mess up constantly and most days I am unsure of how to live this one life with bravery, wholeness and love. So why become a Marriage and Family Therapist, create a website titled "Living Authentic" and share stories and reflections that stem from wholehearted living when more often times than not, I'm living in my own insecurity, fear and brokenness? Well the quick answer is because I'm imperfect and that's okay. It's okay that I struggle. It's okay that I don't have it all together. It's okay that I wrestle with my own uncertainties and insecurities. But it's my imperfections and yours that make us people who can live authentic lives, and authenticity is the only pathway to joy. Perfectionism is built on "shoulds," shame and shallow thinking. Authenticity is built on acceptance, courage and love. We must ask ourselves over and over again, do we want to live an authentic life or a perfect life? When I chose to live a perfect life I was always left unsatisfied, empty and searching for more. I was never good enough and nothing ever felt enough. But through the pursuit for perfection I learned the hard way that life is not about aiming for perfect. Life is about allowing ourselves to be imperfect and thus giving our imperfections permission to make us more real. This is why I do the work I do and fight for authentic living. I believe if I am not fighting for a more authentic life, I will allow my own fears, insecurities, failures, or limitations to swallow me and by my example I will encourage others to do the same. Therefore, the fact that I know pain and continue to experience my imperfections does not make me inadequate or incapable. It doesn't even make me a less effective therapist. It just makes me someone who has something more to offer-my whole and my own broken self. So I dedicate this site and my therapeutic work to the messiness, the fragility, the chaos, and the imperfections in each of us, with the hopes that together we can continue to discover a life that brings more hope, more love, more wholeness, and more authenticity. Have you ever thought you couldn't be or do something because you were afraid of your own imperfections? How did this fear impact your life? When you think about your life, when do you feel like your most authentic self? How have you tried to be perfect? In what ways has aiming for perfection limited you? How can your own imperfections make you more real? How can you use more of your whole self- the broken and the whole parts? How can your whole self benefit another person and help you feel more connected to the imperfect, fragile and messiness of life?